This French upside-down pie has become my signature dessert. I try to time the rest of the meal so that I can put the tart in the oven as we sit down to dinner. Few desserts are as dramatic or delicious as a tarte Tatin served hot from the oven with freshly whipped cream. Classic tarte Tatin is made with apples, but I've also had great success using everything from apricots to pineapple. Baking the fruit in caramel with a crust on top brings out the very best in any firm, slightly tart fruit. I'm often asked what kind of apple makes the best tarte Tatin, to which I always answer, "The one with the best flavor and texture at the time." In the late summer and beginning of fall, this might mean an early variety like Gravenstein. Later in the season, there are oodles of good choices. I'm partial to Cameo, Honeycrisp, and, during the winter months, Pink Lady apples. Prepare to bake: Preheat the oven to 375 degrees. Prepare the caramel: Melt the butter in a 10-inch cast-iron or enameled skillet over medium heat. (I use a Le Creuset enameled brazier, also called a wide French oven.) Add the granulated sugar and brown sugar and stir. When the sugars begin to melt and bubble together, remove the pan from the heat and add the cinnamon and vanilla. Don't worry if the caramel begins to separate; it will come back together in the oven. Prepare the apples: Set one apple aside. Peel and halve the remaining apples or, if they're unusually large, quarter them. Place the apples in the caramel, rounded side down, packing them as tightly as possible and filling any gaping holes with apple chunks. Peel and thinly slice the remaining apple, then shingle the slices to create a single layer covering the larger apple pieces underneath. Roll out the pastry: On a lightly floured surface, roll out the pastry to a thickness of ⅛ inch. Cut a circle from the dough that measures 12 to 13 inches in diameter and place it over the apples, tucking the edges down inside the pan. If you don't plan to bake the tart immediately, refrigerate it. Bake the tart: Bake the tart for 20 minutes, then lower the oven temperature to 350 degrees and bake for 30 to 40 minutes more, until the crust is a deep, rich brown. Let the tart cool for about 5 minutes, but don't wait much longer than 10 minutes to turn it out, or the caramel will set up and harden, causing everything but the crust to stick stubbornly to the pan. Turn out the tart: To turn out the tart, used a round platter somewhat larger than the pan. Place it on top of the pan and, in one swift, deliberate movement, invert the tart so that the crust is sitting on the platter and the beautifully caramelized apples are on top. Be extremely careful as you attempt this maneuver; sugar burn is the worst kind. Serve with a dollop of lightly sweetened whipped cream or a small scoop of vanilla ice cream. Culinate editor's note: A recipe for Rough Puff Pastry is in The Grand Central Baking Book. Also, on Culinate we feature Martha Holmberg's version from her book Puff. Finally, store-bought puff pastry or a sturdy pie crust also work well. 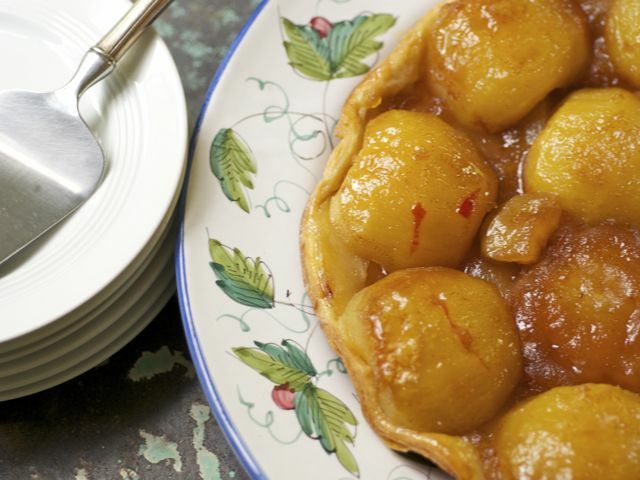 For more about baking tarte Tatin, see our how-to post featuring Piper Davis.